To put it simply, I love your story. You were a gifted young man with a dream and no matter how others tried, you believed in it and eventually lived it. Yours was a quintessential rags to riches story, peppered with drama, intrigue and lies. Perfect for Hollywood or better still, reality TV – stuff that pre-occupy our generation. I’ve read your story countless times and I’ve heard it taught even more. Each of those times it was a reminder that irrespective of what people may do to stifle or oppress a dream, if we continue to walk with God and believe, that dream will come true. Simple. It gave me hope that there was a light at the end of whatever affliction or difficult experience I was facing. The palace was awaiting! Hallelujah! Unfortunately this adoration suffered a great setback recently. Lately I find that I struggle to think all you did was right or good. Is that bad? Forgive me if it comes as a surprise, but let me set my thoughts in order. The question is: why are we blessed? The question is: why are we blessed? Daniel, a man gifted in much the same way as you with discerning mysteries and interpretation of dreams said such gifts were given to save lives. It’s not just for the sake of kings or our families, but all such as might be at risk of death – in his case, Babylonian magicians, sorcerers and wise men. 1Daniel 2:30 You more or less agreed with Daniel on that one. From suffering to success you rightly identified that the journey you took to the palace, though painful, had a purpose – to save lives. 2Genesis 45:5-8 And this you did by giving Pharaoh the blueprint for the survival and sustenance of the Egyptian empire. As a result, you were blessed with the responsibility of executing this plan. Come the time of famine and grain of immeasurable quantity had been stored in the storehouses of the Pharaoh, your purpose seemed to change. It was a subtle change hardly noticeable by many… maybe because you remained extremely diligent. But it changed. Why do I say this? Well, you started off by trading corn for money and when the people ran out of money, you traded the corn for their land and livelihood. 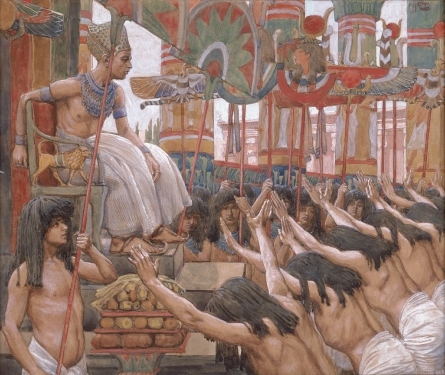 When you had acquired all the land for the Pharaoh’s purse and the people had nothing with which to buy food, they wilfully enslaved themselves to the Pharaoh at your bidding. By the time you were done with them, they were tilling the land they once owned for the pleasure of the Pharaoh. You impoverished the people that God empowered and prospered you to save. All for the increase of the Pharaoh. Do you see where I’m going with this? You impoverished the people that God empowered and prospered you to save. All for the increase of the Pharaoh. I know some might argue that you were still doing God’s work and that eventually the people lived because of you. For that, they ought to be grateful. I agree. But I ask, could what they ended up with be called living? Would the God you walked with be pleased? I think not. In scripture 3Leviticus 25:17 he spoke against the very thing that you did. His instructions to his people on taking advantage of others less fortunate than they were was clear. Do not do it. Even if a man was indebted to them, they were instructed not to take his coat, the last thing he had to keep himself warm. 4Deuteronomy 24:10-13, Exodus 22:26-27 If at all they took another’s land as security or payment for a debt, they were required to return it after 7 years. 5Leviticus 25:25-28 This was even when they could validly take what they were owed! Through the mouth of the prophets that came after you, he spoke against the acquisition of wealth and land to the detriment of others – exactly what you did. 6Isaiah 5:8-9, Jeremiah 22:13 And let’s not forget that you were as good as any prophet. You had the gifts of dreams, visions and interpretation of these dreams. You acknowledged that you could divine. 7Genesis 44:15 Did you divine from Yahweh the course of action you took in dispossessing millions? Again, I think not. To be honest Joseph, you appeared to have ceased to serve at the pleasure of Yahweh and served at the ruthless desire of the Pharaoh. You were more interested in securing your position in Pharaoh’s cabinet – self preservation at its best. You were no longer in the business of saving lives but enslaving them. Quite frankly, the only life you sought to save was yours. Your God given purpose was well and truly extinguished. Yes, yes. That might be a bit harsh but I’m looking at and addressing your actions as recorded. Perhaps it didn’t look that way to you because as other historical records demonstrate, you and the Pharaoh were really tight – linked by ancestry. Maybe that might explain your readiness to plunder to remain in his good books. You planted seeds of hatred, so vile and so deep that it ate latter generations up. Some historical records state that at the time of your prosperity, the Pharaoh in power was not an Egyptian. He was of the Hyksos dynasty. Does that sound familiar? Well, permit me to help jog your memory. They were rulers who were foreign to Egypt, who had overpowered the Egyptian family of Pharaohs and ruled for many years before being ejected. Now do you remember? I knew you would because they were Canaanites and descendants of Shem like your good self. That would explain why the Pharaoh had herds and flock to tend when it was clearly stated in scripture that the Egyptians hated shepherds. 8Genesis 46:34 That would also explain why your family was given the best portion of land in Egypt after they confessed to excelling in shepherding, a profession that was detestable to the Egyptians. It would be safe to say that in Egypt, good shepherds (or any shepherd for that matter) would have been hard to come by. I mean, where else would a foreign flock herding ruler find someone he trusted to care for his flock, especially when he ruled among shepherd haters. Well, as fate would have it, with his kinsman! Dare I say that your ‘relation’ to the Pharaoh made it easier for you to show more of an allegiance to him than to the people you were meant to be saving. After all, blood is thicker than water and in your case thicker than spiritual purpose. When spiritual gifts and blessing are diverted to serve the inordinate, avaricious and acquisitive appetites of kings and despots posterity suffers. Some might call me a rabble-rouser and my ideas a mere conspiracy theory, but the more I think about it the more I wonder whether the blame for your people’s 400 year stint in slavery could be laid at your feet. It could explain why the Egyptians hated your people with a genocidal passion and why, with you dead and the Hyksos rulers ousted, they turned on the Israelites. They made your descendants slaves, just like you had enslaved them in their own land. You can only reap what you sow and you had planted the seeds of hatred, so vile and so deep that it ate latter generations up. Quite frankly, you ended up an example of how not to use the gifts God gives. For when God’s purposes are subverted, when spiritual gifts and blessing are diverted to serve the inordinate, avaricious and acquisitive appetites of kings and despots, when men and women of God choose to ally themselves with power rather than the people for whose sakes the gifts and fortune was bestowed, posterity suffers. So Joseph I hope you now understand what made me write you; it is concerning to say the least and makes for sober reflection. Because your latter decisions made it very difficult to find in you the Joseph who refused to lay with Potiphar’s wife, all because it would displease his God.